Debra Smith : Earth's first beachcombers ended up in Australia. Sydney Morning Herald: Weekend Edition, May 14-15 2005 , News, page 13. Forster and Matsumura: Evolution: Enhanced: Did Early Humans Go North or South? They stuck to the coast and they moved quickly until they reached Australia. Modern humans who left East Africa more than 65,000 years ago and eventually populated the globe were beach-combers who headed south first, moving around the shores of the Indian Ocean at up to four kilometres a year, new genetic research of indigenous people in South-East Asia suggests. 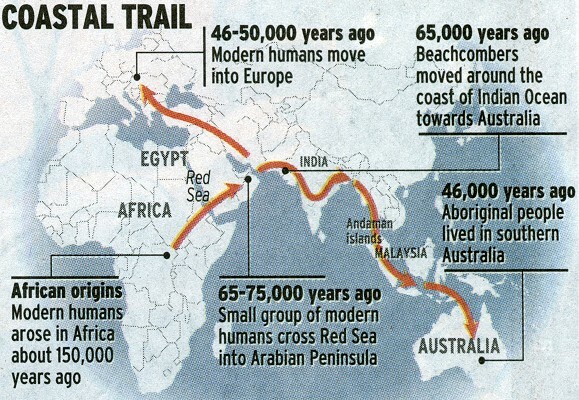 This southern journey - dubbed the coastal express train route - which started with crossing the Red Sea, explains how Australia was inhabited thousands of years before modem humans colonised Europe. It challenges the theory that the first successful wave of people leaving east Africa went north into Egypt and the Middle East. Seafood would have been plentiful, and the travellers would have had to adapt to only one environment, rather than learn how to survive in the deserts, rainforests and shrublands of an overland route. Most scientists agree the human species arose in Africa about 150,000 years ago. To find out where they went next, two teams of researchers studied the DNA of indigenous people in South-East Asia, one testing isolated tribal groups on the Andaman Islands, off India's east coast, and the other the Orang Asli, or original people of Malaysia. They looked at mitochrondrial DNA, which is passed down from mother to daughter and can be used as a historical clock, based on the mutations that have accumulated in different populations. The teams came to similar conclusions, published in the journal Science yesterday, that the two different populations in South-East Asia were descendants of people who lived in India about 65,000 years ago. The team that studied the Orang Asli calculated that the journey around the Indian Ocean coast to Australia was rapid, "most likely taking only a few thousands years", requiring speeds of between 700 metres and four kilometres a year. Aboriginal people inhabited the south of Australia by 46,000 years ago, yet in Europe the earliest known remains of modem humans are only about 35,000 years old. Researchers from the University of Cambridge commented in the journal that isolated, indigenous populations like the Orang Asli were dwindling, so time was running out to study their DNA. They hoped the research would also inspire archaeological studies in the Arabian peninsula, where more clues about these early beachcombers could stilI lie. Geoff Cater (2005-2014) : Debra Smith : Coastal Migration, SMH, 2005.